The other day I opened up the latest issue of Bon Appetite magazine and saw a beautifully photographed baked swiss chard and egg recipe. I have been seeing a lot of gloriously baked dinners with eggs on top. Loving eggs as we do in our family, I have been cracking them on top of thick creamy soups, baking them on pizzas and now….casseroles. This is not your usual company egg recipe. The company egg recipes I have read are more like a frittata; scrambled eggs combined with cheese and mixed with other ingredients, then baked until firm. Swiss chard is abundantly in season right now and suddenly I knew what we were going to have for dinner that night. When I stopped at the market to buy the swiss chard, I picked up a delightful aged white cheddar. I imagine a typical cheddar would be fine in this recipe, however, the flavor of this mature cheddar was extraordinary. 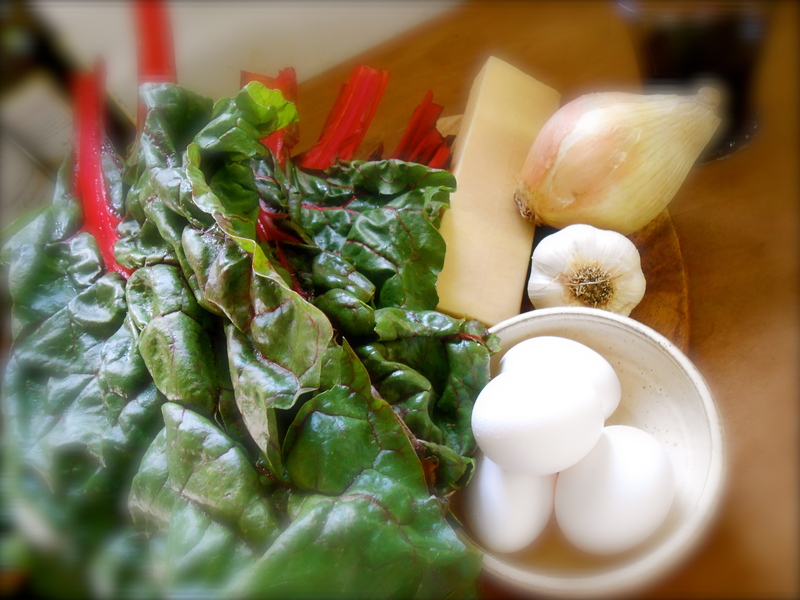 When I make this recipe again I will use 4 bunches of swiss chard. I felt the “bed” the eggs laid on was a little thin. The original recipe used 12 eggs. With three of us around our table I only used 4 eggs. Add more according to your appetite and number of gathered guests. I used half and half instead of heavy cream, only because that is what I had in the refrigerator. I served our company eggs with warm naan and roasted beets topped with garden fresh chives. Preheat oven to 400°. Heat oil in a large skillet over medium heat. Add onion, garlic and a sprinkling of salt and pepper. Cook, stirring occasionally, until onion is softened, 5-8 minutes. Add chard to the skillet by the handful, tossing to wilt between additions. Cook until tender, 5-8 minutes. Add half and half, simmer until thickened and almost evaporated. Place your chard mixture evenly in a 13x9x2-inch baking dish. Using the back of a spoon, make evenly spaced divots in the chard mixture. Crack 1 egg into each divot. Season eggs with salt and pepper. Sprinkle your cheddar all over. Bake, rotating dish once, until egg whites are almost set and yolks are still a bit runny, 15-18 minutes. Let stand 5 minutes before serving while the eggs set. I am so going to try the pillowcase spinning technique. I have never bought a salad spinner, don’t know why just hand dry with paper towels. I like the pillowcase idea, it’s brilliant. Your eggs are wonderful, I love baking eggs never tried chard with them before. Sounds absolutely delicious. I think you’ll never use paper towels again after your try the pillow case! :) Even tonight I spun our romaine and I do giggle every time I spin greens….in a pillow case! The eggs and chard was amazing Suzanne. And so simple. Hahaha, I can’t manage without a salad spinner, it’s difficult with a pillow case when you live in an apartment! 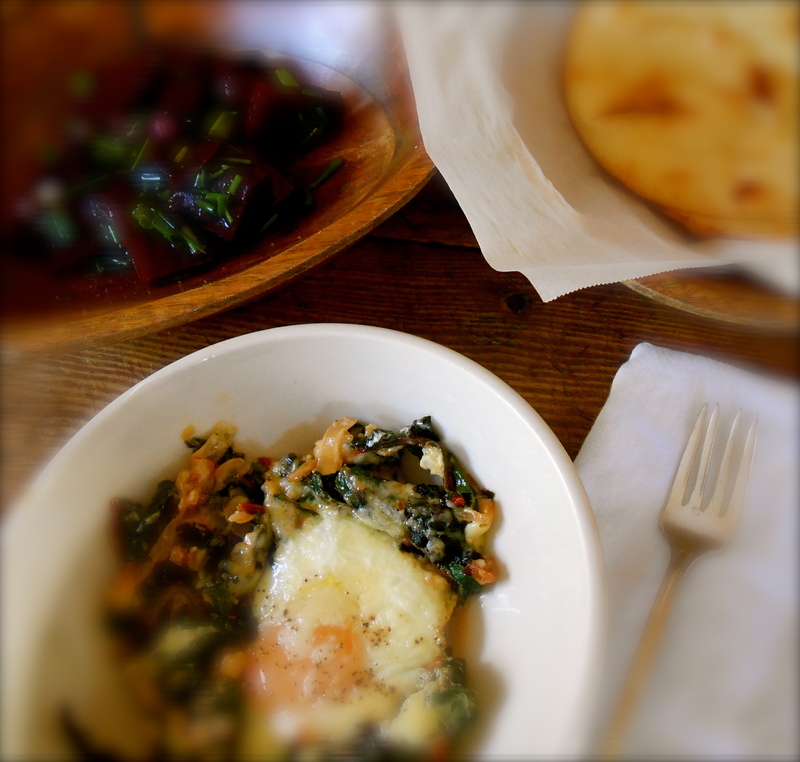 I love the eggs baked on chard idea. I just love eggs baked in too! Actually, they can be poached or fried –it’s delicious on almost anything. :) Lovely post. I agree. I am really enjoying eggs these days on all kinds of dishes. Thank you for your comment. Interesting way to wash you lettuce ;) Never had such meal before, absolutely trying it – thanks for sharing! I love this recipe. Your photos are absolutely beautiful! I am so pleased to hear you made the company eggs! I wish I could take full credit for the deliciousness of this dish. I found it in Bon Appetite and just had to share it! Well, maybe the pillowcase will come in handy sometime in the future! :) Thank you for your kind comment. I love Ruby! I love that story about the pillow case! I use my trusty salad spinner every day, but I should do this while visiting my in-laws! Also the meal looks amazing! Isn’t that pillowcase method hilarious. I still laugh when I use it. Thank you for all your kind comments this morning Shanna. (do you pronounce it Shawna?) I do but my spelling is Seana. You are currently reading company eggs for dinner at COTTAGE GROVE HOUSE.